Probably one of the power movements – cleans or snatches. Anything that doesn’t require a full squat! 3. What is your least favorite WOD/movement? Assault bike, I’m fairly certain I look like a baby giraffe when I try to walk after a sprint. 4. What were you doing before CrossFit? How did you hear about CrossFit and/CrossFit Northlake? I ran a little bit here and there but was not what anyone would consider “in shape” and certainly not an athlete of any kind. My brother in law who lives in Oregon had been doing CrossFit for years but I always thought it was for the super-fit athlete. My husband and I decided to give it a shot and we both loved it. 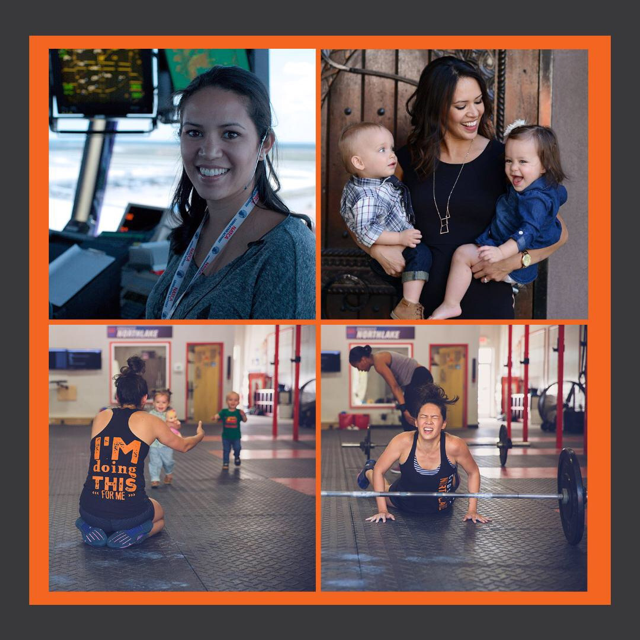 We started at Crossfit Mountain Island but after having the twins I needed a gym with childcare. My brother in law had done a drop in at Northlake while visiting and told us what a great gym it was. 5. What other sports or activities do you participate in as a family besides CrossFit? 6. How many times per week do you CrossFit? 7. What is your athletic background? 8. Give us some insight as to your thoughts after your first workout at CrossFit Northlake. I’m dead. Will I ever walk again? What are they feeding these people? Who are these incredibly strong women in the ladies class? I also realized I had not learned to do a lot of the movements properly at my old gym. I had to drop weight and really concentrate on technique. I appreciate the coaches noticing and making sure I did it right to avoid injury. 9. Do you have any special or favorite CrossFit Northlake memories/moments? 10. What advice would you give to a newbie or someone just joining CrossFit Northlake? 12. What kind of results have you seen since starting at CrossFit Northlake? I actually feel strong for the first time in my life. It had been a running joke with family and friends growing up that I was not athletic and pretty wimpy. Well, I beat my sister in an arm wrestling contest recently and that may have been the highlight of my life. My kiddos are the reason for all of this. Not only do I want to be healthy for them, it is important for me to set a good example for them to be healthy and strong!